Here in Australia, we’re known for our wide array of dangerous wildlife. Spiders are among some of the most feared native creatures. While spider bites are less common than one might think, they do still happen, and in some cases, it can be a matter of life and death to know what kind of spider you may have been bitten by and how to deal with it. Spider bites are not the cause of fatalities in most cases, but this is, of course, entirely dependent on the advents of modern medicine and anti-venoms. 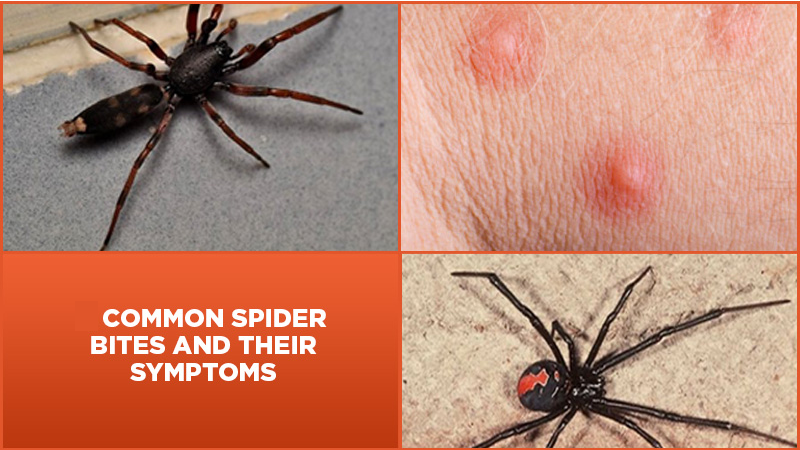 Here are some of the most commonly encountered species of spiders in Australia and what to expect if you have had the misfortune of receiving a bite from one of them. If you are looking to avoid spiders altogether, book DENTEC Pest Management for your pest inspection. White tail spiders are very common and can be identified by the tip of their lower back side, as it is white, just like its name suggests. They are about average for a spider in size and look about as friendly as you would expect. The white tail spider was the recipient of some rather scary (and as it turns out, unwarranted) media attention. It was said that a bite from a white tail would cause an ulcer which would progress into necrosis, similar to the results of a bite from a redback spider or brown recluse. While this has been a topic of debate, the evidence of recent studies suggests these claims are false, and the white tail spiders are relatively harmless. If bitten by one of these guys, you will still experience pain, localised irritation such as swelling, stinging, itching and raised the surface of the skin. This will eventually subside on its own. The redback spider is once again named based on its appearance. That is, it has a red mark on its back. They are otherwise black in colour with a round lower abdomen. Unlike most other spiders, this one is dangerous, and you should avoid them wherever possible. Bites from a redback spider may even go unnoticed initially, as it takes a little while for the venom to start to take effect, but once it does, it’s all bad. It starts with intense muscle pain, stomach pain, vomiting, confusion and elevated vitals such as heart rate and breath. After some time, the bite area will ulcerate and become a point of developing a condition known as necrosis. Necrosis is when the skin and tissues start to rot. The rot spreads and can even become gangrenous if left untreated. In extreme cases, a bite from a redback can result in the need to amputate entire limbs or even death. Early treatment is crucial. If you should happen to be bitten by a spider and you know that the spider is highly venomous or are unsure, you should waste no time in seeking the proper treatment. If you go to a hospital, it is a good idea to take a picture of the offending spider, as this way the hospital staff will know exactly which spider has bitten you and how to treat it. To avoid spiders in your home, contact DENTEC Pest Management for spider control services. Are Termite Treatments Safe For Children And Pets? This Homemade Device Will Free Your Home From Mosquitoes Fast. Q & A: What’s the most dangerous spider in Dubbo? Termite baits explained: See how they protect your home from termites.